oh and i think i'd be covered from FMLA since i've worked here for over 3 years and i work over 20 hours/week. thanks so much ladies! i had read that there were some studies that said working night MAY put you at great risk for pre-term labor, something to do with the flipped circadian and all, so that freaked me out. when i worked in general medical, i rarely did nights but kind of hated them. i appreciate all of your thoughts. keep 'em coming in fact! hi everyone! i started about 3 months ago in an outpatient rn job. i came from inpatient medical. i was recently offered to interview at my dream job - labor and delivery. the hitch is that i am 7 weeks pregnant and the position is 36 hour nights! has anyone worked nights while pregnant? what was it like for you? did you regret it? the thing is, i plan to cut down to 24 hour nights after the baby is born so it seems like it is a discomfort that may be worth it if i am eventually able to work 2 days a week. whatcha think? Hello! I was curious if anyone here works for the VA system in the Boston area? I have a BSN and have worked for MGH for over 1.5 years and heard great things about the VA system. Does anyone have any information on wages? If you work there, do you like it? What do you like about it? What is the population like? 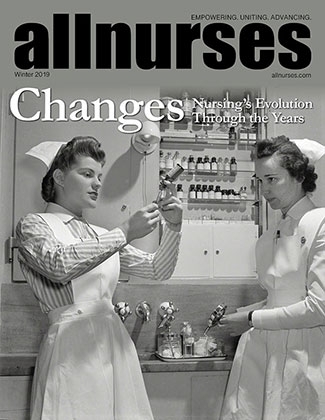 Do nurses and MDs have a collaborative relationships? Anything else I should know? Thanks for you help!